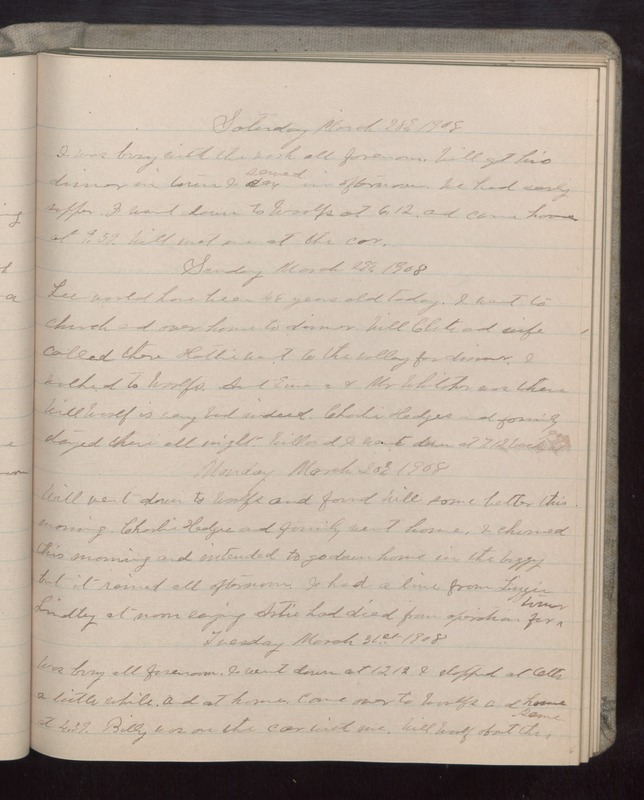 Saturday March 28 1908 I was busy with the work all forenoon. Will got his dinner in town I sewed in afternoon. We had early supper. I went down to Woolfs at 6.12 and came home at 9.39. Will met me at the car. Sunday March 29 1908 Lee would have been 46 years old today. I went to church and over home to dinner. Will [Clite?] and wife called there Hattie went to the valley for dinner. I walked to Woolfs. Aunt Emma & Mr. [illegible] was there Will Woolf is very bad indeed. Charlie Hedges and family stayed there all night. Will and I went down at 7.12 back at 9.39. Monday March 30 1908 Will went down to Woolfs and found Will some better this morning. Charlie Hedges and family went home. I churned this morning and intended to go down home in the buggy but it rained all afternoon. I had a line from Lizzie Lindley at noon saying Artie had died from operation for [tumor?]. Tuesday March 31st 1908 Was busy all forenoon. I went down at 12.12. I stopped at Otts a little while and at home. Came over to Woolfs and home at 4.39. Billy was on the car with me. Will Woolf about the same.